Is DC Universe Streaming App Worth It In 2019? You are here: Home / Comics Guides / Digital Readers / DC Universe Streaming App Review! What’s In The Library and Is It Worth It? In the span of six months since DC’s Titans debuted on the DC Universe app, the offering has expanded and improved significantly, to the point that I’m writing a completely revised review for those wondering if DC Universe is worth it. Honestly, the progress DC Universe has shown in 6 months suggests a genuine willingness to listen to community feedback, and a surprisingly deft touch when it comes to unique quality content. As a whole, the app is quickly reaching “must have” territory for DC fans. The Overview – What is the DC Universe App? DC Comics has entered the streaming library wars with DC Universe, covering DC movies, live action TV, animated TV series, and most importantly, comics! It’s been a long time coming for DC, with the likes of Marvel Unlimited and Comixology Unlimited available for years, but the available offerings are broader than any comics industry rival can claim. For $7.99 a month, or $74.99 annually, DC fans can join DC Universe now. The service is available via desktop, tablet, or mobile device, with app downloads available via Apple and Google Play. DC Universe is not currently available on either Kindle, Windows Surface, or PS4, at least without giving your alternate device access to Google Play. There are no limits to how much available content one can view via DC Universe, although it should be noted that even with dramatic increases, DC Universe does not offer literally every DC movie, TV show, or comic book ever. It’s worth reviewing what’s actually in the library at any given time to see how it maps to your tastes. At launch, the most fanfare for DC Universe was given to live-action exclusive TV like Titans, Swamp Thing, and Doom Patrol (as well as animated exclusives like Young Justice: Outsiders). With Swamp Thing set to debut in late May 2019, DC Universe will have 4 exclusive shows to it’s name since Titans premiered as the first offering on October 12, 2018, with plans for more including a Harley Quinn animated series later in 2019. 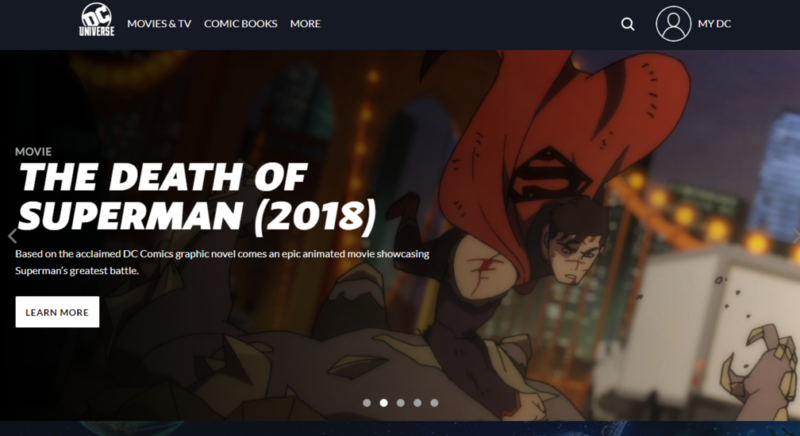 Otherwise, DC Universe watching is well suited right out of the gates for fans of the DC Animated Universe, whether on TV or in feature-length movies. I’d also be remiss if I didn’t mention, I’m head over heels in love with Doom Patrol, which is easily my favorite comic book tv show of 2019. For my money, it’s the first must-watch series available exclusively on DC Universe, and tops recent series like Netflix Umbrella Academy or Daredevil season three. For my money, Titans was more mediocre but interesting, and Young Justice: Outsiders is a pretty excellent continuation of the animated all-timer. The short take here is that I love the Animated Series offerings, and have already queued up a quick hit of Super Friends for my nearly two year old son. I’d like to see Teen Titans GO! added to the roster, but as someone who has never watched most of Static Shock, there’s plenty here for me to explore. The main content limitation seems to be that ongoing TV series (CW’s Arrow and Flash or even Fox’s Gotham) are not yet available in the app. Presumably there are licensing issues, although in the case of Krypton on SyFy, the first season was made available on the app shortly after concluding its live run. Streaming is easy on Wi-Fi, or through data plans, and essentially, you can download episodes to watch offline. This is seemingly only limited to your device’s storage capabilities. A smart TV will go a long way as well (as will a device like a Google Chromecast) in order to get the DC Universe content from phone or tablet to TV. Which brings us to the DC Comics! As I mentioned there’s been clamoring for a rival DC Unlimited for years, particularly rising in recent years as Marvel passed the 10-year anniversary of Marvel Unlimited. Savvy comics readers have of course been privy to the availability of a great library of DC books over on Hoopla Digital, but the potential of a comics library in DC Universe is obviously very exciting. My initial take on the launch library was that DC Universe includes more comics than I was expecting, fewer than most fans will want, and already more than I reasonably have time to read. My second assessment (“fewer than fans will want”) proved very true, as the majority of DC Universe feedback lamented the lack of a robust comics library, and said they wouldn’t be paying until DC fully committed to an approach more similar to Marvel Unlimited. After some weird strategic mis-steps (adding new series, but simultaneously removing large swaths of comics from the library), DC Universe announced at Wonder Con 2019 an intent to place their entire digital comics catalog in the DC Universe app. This is fantastic for subscribers, and combined with the quality of Doom Patrol suggests a strong value for those who were on the fence about the whole service. Although launch included a healthy smattering of deeper cuts that I was personally very excited to check out (over 70 issues of 90’s Aquaman, the Greg Rucka written Checkmate from the 2000’s, and the Kate Spencer as Manhunter series to name a few), my very scientifically sound calculations found 296 unique comic book series, and a total of 2,397 actual issues in the DC Universe library. The promise of thousands more throughout April 2019, is a huge boost to the DC Universe experience! Despite the bold claims of the initial announcement, there do appear to be some caveats to the library additions (for example no plans for Vertigo books right now, and some all-time best-sellers like The Killing Joke won’t make it into the app – source). This doesn’t really mitigate my excitement, but it’s important to call out given the publisher’s claims that they’ll be adding everything. 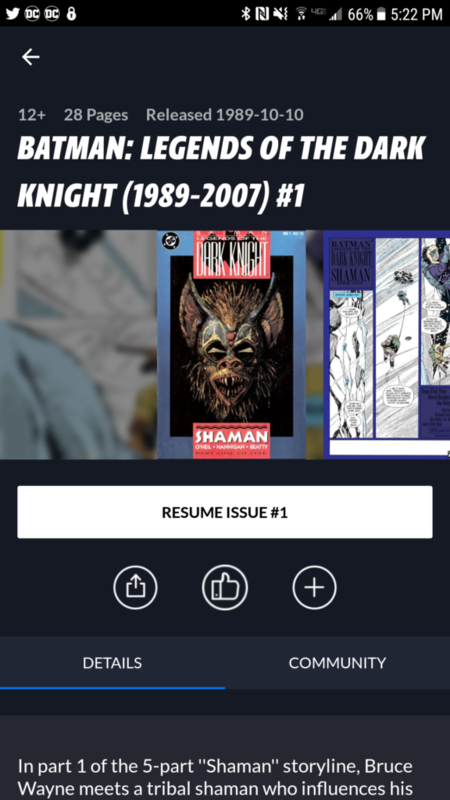 When I first wrote my review of DC Universe, I included a list of every comic book series available in the app, but as the library expands, that’s increasingly a fool’s errand. What I would recommend instead, is that you view the DC Universe comics library directly, and scan for books of interest. You can do so without even setting up an account right here. While a number of comics reading elements (for example “smart panel” zooming) have been very strong out of the gate, others (sorting and filtering comics series) have been slow to progress. Initially readers had to download issues to their app via wi-fi, which was a strange experience when you were looking to simply stream at home (or, ya know, at work when your boss wasn’t around). This has been fixed, and now the default reading experience simply loads up the books over your internet connection without downloading to your device (unless you want to!). Tablet reading has stopped forcing your app into landscape mode, meaning you can hold your comics vertically again without the terrifying confusion of an app that won’t stand upright! As far as I can tell, DC Universe has done away with the insane practice of only including a single issue from a series as a “hook” to get readers to buy the remainder. The biggest concern is still the fact that navigating your way through DC Universe can be a challenge. DC Universe is in the process of making this experience smoother, adding in sorting and filtering options by particular characters, categories, and most interestingly, “eras” of comic book history. That said, unless you have a pretty good idea exactly what you’re looking for, or are using one of the DC Universe pre-established “collections” (these tend to put events in some semblance of a reading order), the comics library is fairly intimidating. This problem will only grow as more comics are added (just ask Marvel Unlimited), so I’m expecting the DC Universe dev team to continue improving their search and sort options. This may come as little surprise from the guy who thought My Marvelous Year was a good idea, but I’d love to see a “release date” sort option as the library grows, so readers can explore all the DC Comics released in 1969, and so on! Reports indicate DC Universe should be available on Xbox One by the end of April 2019, which is really cool to see from the publisher! A note regarding Kindle Fire devices: DC Universe is accessible if you download Google Play to your device. I’ve done this recently for both DC Universe and Marvel Unlimited, and it works like a charm! And thanks to readers in the comments for the alert, that DC Universe is also only available in the US at this time. 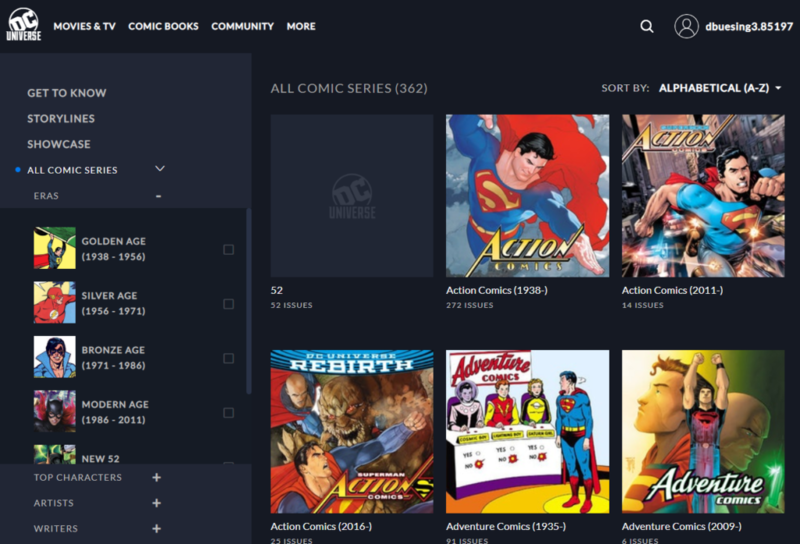 How does the DC Universe comics library compare to Hoopla? A lot of Comic Book Herald readers are already asking me how the DC Comics compare to what’s available via library card access to Hoopla digital. Given that I’ve been trumpeting Hoopla as the best digital streaming option for DC Comics for years, this is a sensible question. Even after the massive improvements to the DC Universe libraryl, I’d say Hoopla remains a better bet for the latest DC Comics. DC Universe has announced plans to add “new” comics to their library 1 year after release date, whereas new trades are added to Hoopla the day they’re released in stores. Otherwise, though, DC Universe is well on its way to catching up to Hoopla’s collection of back catalog material. At this stage, I wouldn’t consider the DC Universe app a straight-up replacement for Hoopla, so much as a supplement for more experienced DC Comics readers. Similarly, those who see plenty of overlap and reading options, plus the bonus of TV and movies may find DC Universe the superior combined option. Considering Hoopla is free with a library card, though, there’s never really any need to “remove” the service. If you’re on the fence about DC Universe, I’d recommend starting your free trial and binging Doom Patrol or Young Justice: Outsiders to see where you stand. The major play for the app is in the new release exclusive TV, and I’ve been increasingly impressed by the content to date. For diehards like myself, I see more than enough to get plenty of use out of the app at launch. I’ve got Legion of Super-Heroes comics downloaded to my tablet, and Batman: The Animated Series episodes downloaded for my commute home. Recent comics library expansion is fantastic for subscribers, and combined with the quality of Doom Patrol suggests a strong value for those who were on the fence about the whole service. Might be worth mentioning the service is only available to US residents, however you can get around that using a VPN. Thanks for the breakdown Dave. I also am an early bird 15 monther. So far I’m pretty pleased with the service, and I hope that as the year progresses and more content is added it’ll feel like an even better value. I’m super stoked to watch all the animated series and to read the late 90s Birds of Prey. Regarding Hoopla, all the DC comics in my wishlist seem to have disappeared. Just last month (Aug 2018) I added a bunch of the Batman New 52 and Rebirth trades along with all the Sandman and Preacher books. Today, Sep 15, they’re all missing from wishlist and searching Hoopla returns 0 matches. I found a post on Reddit where someone else had the same experience but a few people responded that they could still borrow DC comics so I’m not sure if this is unique to my library. It just seems odd that it would happen now, right when DC universe launched. Oh weird, that’s a bummer. I just checked my Hoopla items, and the DC selection is as strong as ever, so doesn’t appear to be happening platform wide at this point. I’ve gathered from some folks who work at libraries that Hoopla can be considered a bit expensive, so it could be a case of licensing/fees on a regional basis. That said, worth keeping an eye on! I jumped the gun early and pre-ordered DC Universe before realizing what exactly it offered. Mainly I was looking for access to comics in the Batman and Damian Wayne story lines, since my access to them is currently limited, so I was pretty disappointed perusing through their comic selection. BUT I realized there’s tons there I’ve never heard of, much less read, and I’ve been meaning to get better acquainted with DC’s stories, so I’ll use this year with the app exploring, especially if they’ll be rotating the comic selection periodically. Plus, I’m really excited about a lot of the series and movies available. I’ll make the most of this first year, but I’ll definitely be checking out your thoughts/reviews til then to help me decide what’s the best option for me next year. Thanks! Yeah, the comics rotations will be very interesting. Could make or break the service depending on frequency and quality. For Bats and Damian, they do have the Son of Batman animated movie in there, I believe. Draws on the original Morrison material if memory serves! I went to finish reading The Dark Knight Returns on DC Universe and it’s now reduced to issue #1 only, instead of all 4. Have you noticed this happening with a lot of other titles? I have trouble believing their rotation on the comic collection would be *that* fast, but I don’t have a good feel on the pulse of it. We bought early — primarily for the the comics, but turns out there’s a few things in the library already we’re interested in. We’re giving it a year, and I expect there will be quite a few changes between now and then. How the experience goes will dictate whether or not we’ll renew.